Welcome to Issue #44 of the Bootleggers Buzz! This week we haven’t seen a lot shootings, but there was definitely some action. Event Horizon is officially at war with J.A.I.L and are now playing underground. A few weeks ago J.A.I.L claimed Pennsylvania bullet factory, which was property of Event Horizon. This happening resulted in the wipe of the cute busting crew J.A.I.L. A few hours later J.A.I.L was able to shoot several accounts of Event Horizon. The Buzz contacted both sides to explain you the full story. J.A.I.L was not the only wiped crew, Triumvirate were also attacked this week. The discussion about the new CAPTCHA system continued this week! We at the Buzz are always reading the discussions of the Game Forum and we decided to write another article about the new CAPTCHAs. Unfortunately we couldn’t write an article about a new feature, because there isn’t one! Nevertheless, Sky is doing an amazing job and if we have to believe the latest graphs, the activity on Bootleggers is raising. So what else do we have in this week’s Issue? We have an article about the December Event, which is being held by the Elite Guard. We also have the weekly article ‘Back in the Days’. Unfortunately we don’t have a Behind the name this week. Last, but not least we also have the results of the first voting round of the Buzz Awards 2012. On behalf of the Buzz Team we would like to thank everyone who voted for their favourite players. However, your job isn’t finished yet! This week the final voting round starts. Every category has three nominees. 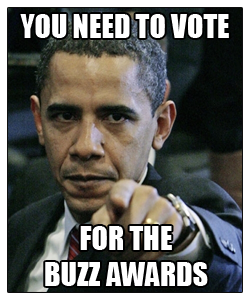 You can find more information about the Buzz Awards in this week’s Issue. The first 50 votes will receive $100,000! That’s all for this week. Enjoy the read and have a good Sunday! Triumvirate wiped by a mysterious Murda-er?! It's December; time for an event! This week featuring; Chaos Mode! RIP to all fallen soldiers! An article explaining the recent crew war between J.A.I.L and Event Horizon! The life of an member for The Family. Being unable to use mobile phones thanks to the new CAPTCHA! He died, but his comics are still alive!